The Seattle Art Museum is saddened to have lost a tremendous friend of the museum. 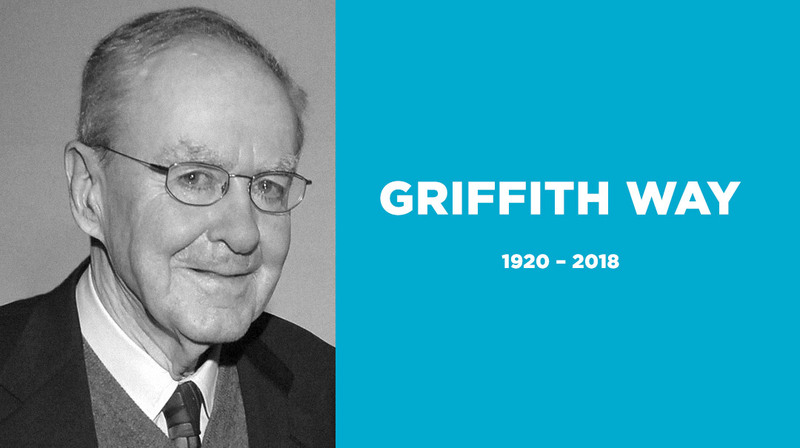 Griffith Way was appreciated for his gentle nature combined with fine humor that enriched everyone who knew him. He became a Trustee of the Seattle Art Museum in 1995 and received honorary distinction in 2009. A graduate of the University of Washington, Griff was part of the first graduating class specializing in Japanese law. He was also an Adjunct Professor, University of Washington School of Law and spent decades periodically practicing law in Tokyo. In 2007, he was honored with the Order of the Rising Sun by His Imperial Majesty Emperor Akihito of Japan in recognition of his long-standing support to increase economic and cultural development between the United States and Japan. Early in their years in Japan, after the conclusion of WWII, Griff and his wife, Pat, became interested in the then-new style of modern Japanese painting executed in traditional media and formats, known as nihonga; a late 19th-century style among artists seeking both cultural continuity and to address Japan’s emergence as a modern nation. Griff and Pat went on to develop a remarkable nihonga collection that they have shared broadly with the public. In winter of 1999, SAM welcomed Modern Masters of Kyoto: The Transformation of Japanese Painting Traditions, Nihonga from the Griffith and Patricia Way Collection presented at the Seattle Asian Art Museum. Their gift to SAM of 150 nihonga paintings has made SAM the repository of the largest collection of nihonga outside Japan. As a member of SAM’s board, Griff served as Chair of the Seattle Asian Art Museum Committee and then as Honorary Chair of the Seattle Asian Art Museum Campaign Committee. As Trustee Emeritus of the Blakemore Foundation, Griff facilitated critical funding from the Foundation, which has supported SAM since 1992, most notably through the Blakemore Internship Program for Asian Art at the Asian Art Museum. Griff’s unwavering dedication to the Seattle Asian Art Museum will be remembered by the museum and community in a future reading area named in his honor, of our McCaw Foundation Library. Griff’s commitment to Asian art and culture will continue to inspire us and our role in connecting with Asia as never before. 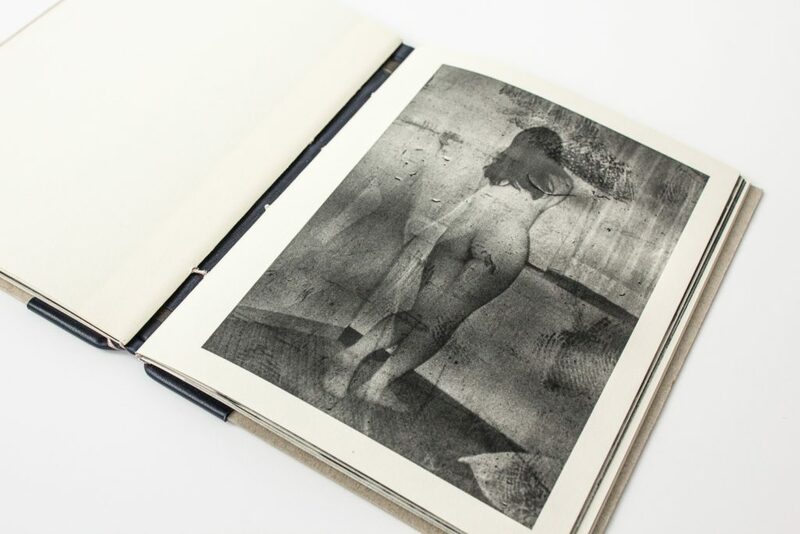 This is the fourth in a series of posts about an extraordinary photobook collection donated to the McCaw Foundation Library for Asian Art by collector, Chris Harris. 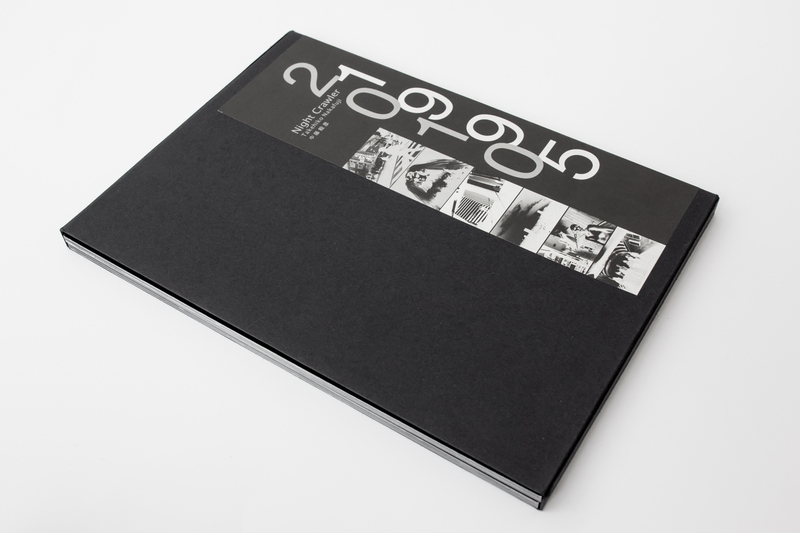 Photobooks are photography-illustrated books which may or may not include additional text. The photography drives the content, rather than being supplemental to the written word. 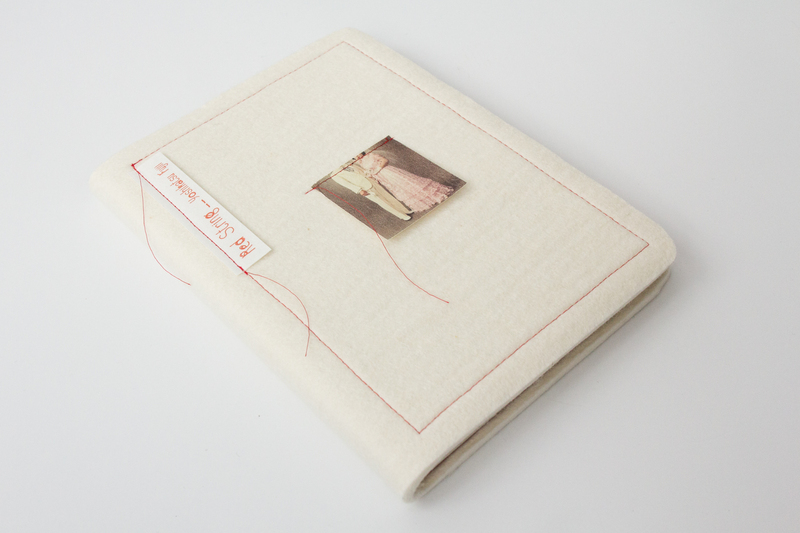 Often handmade, self-printed, or published in limited editions, these books are considered works of art themselves. 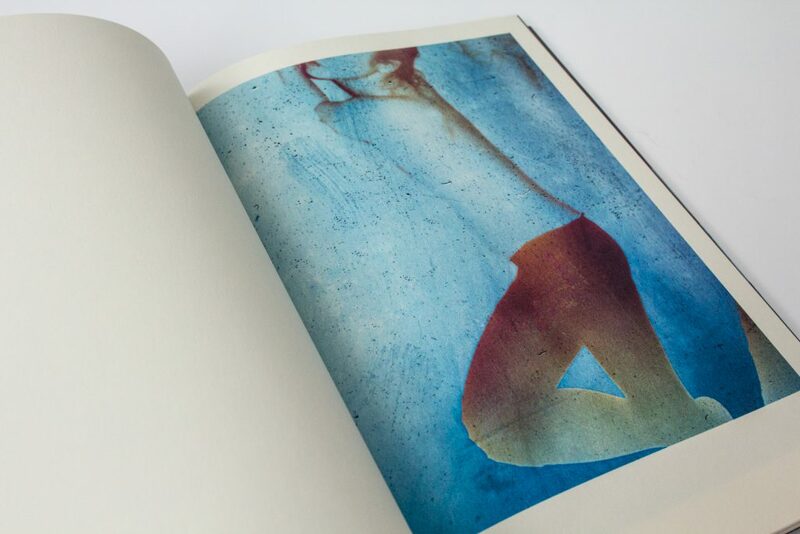 Photographer Daisuke Yokota shares his distinctive interpretation of people and places in two photobooks which were donated by Chris Harris to the McCaw Foundation Library. Urban life can be a hard place with sharp edges, yet people navigating them can retain some softness. 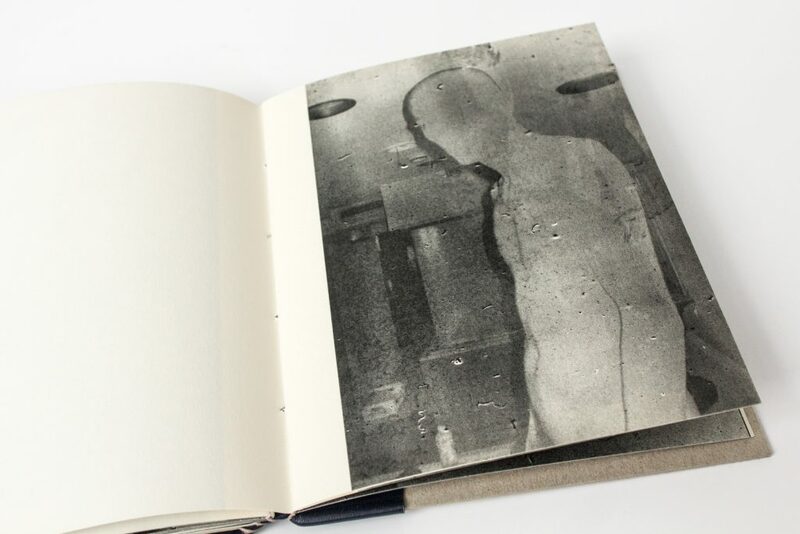 Yokota shows us his haunting perspective of this paradox in his photobooks Immerse (Akina, 2015) and Linger (Akina, 2014). In Immerse, Yokota explores the interplay of unexpected textures and startling vulnerability. Images like these take on an abstract quality, creating the evocative tone of Yakota’s work. Color and composition enhance a coincidence of defenselessness with a suggestive boldness. 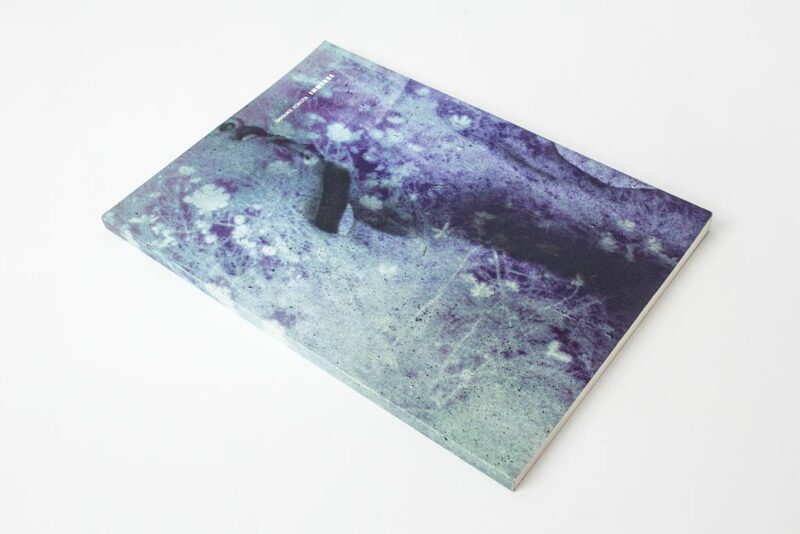 Daisuke Yokota’s hand-bound photobook, Linger, contains images as unpretentious and stark as the cover itself. In Linger, Yokata continues to explore the interplay of texture and form. Images of intimate poses and private spaces convey a sense of softness within a hardened world. Grainy and startling, these images hint at a complicated way of life, asking more questions than they answer. Simple and fascinatingly disturbing, the photographs in Linger are a rich, sometimes perplexing, observation of humanity’s adaptation to life in modern settings. These photobooks are available for consultation at the Dorothy Stimson Bullitt Library at the Seattle Art Museum downtown by appointment while the Asian Art Museum at Volunteer Park is undergoing renovation. When the Asian Art Museum and the McCaw Foundation Library reopen, the photobooks will be available there as an ongoing resource. 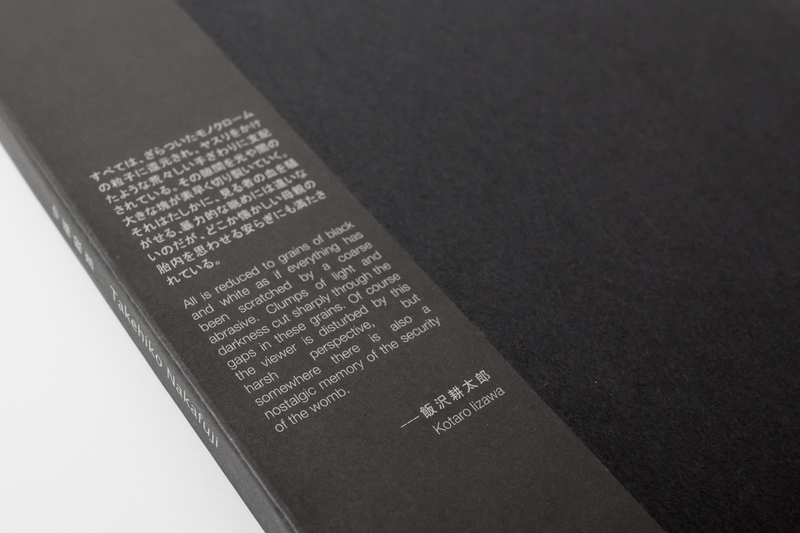 This is the first in a series of posts about an extraordinary photobook collection donated to the McCaw Foundation Library for Asian Art by collector, Chris Harris. 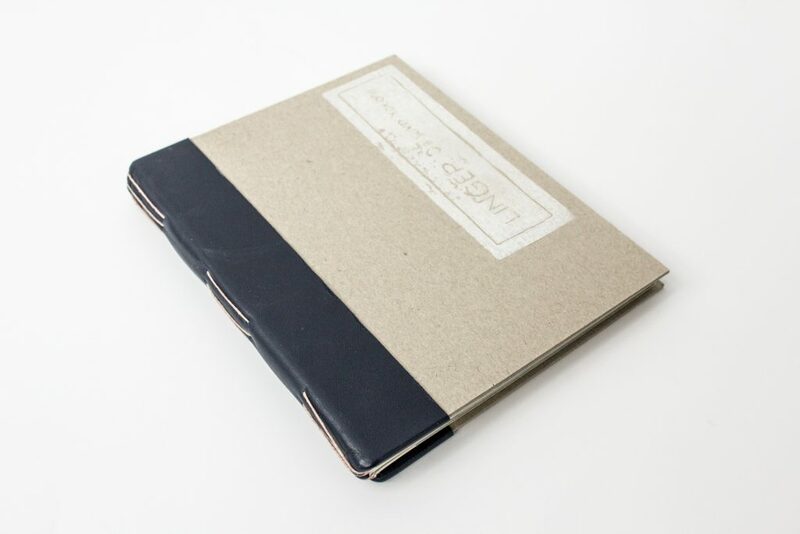 Photobooks are photography-illustrated books which may or may not include additional text. The photography drives the content, rather than being supplemental to the written word. 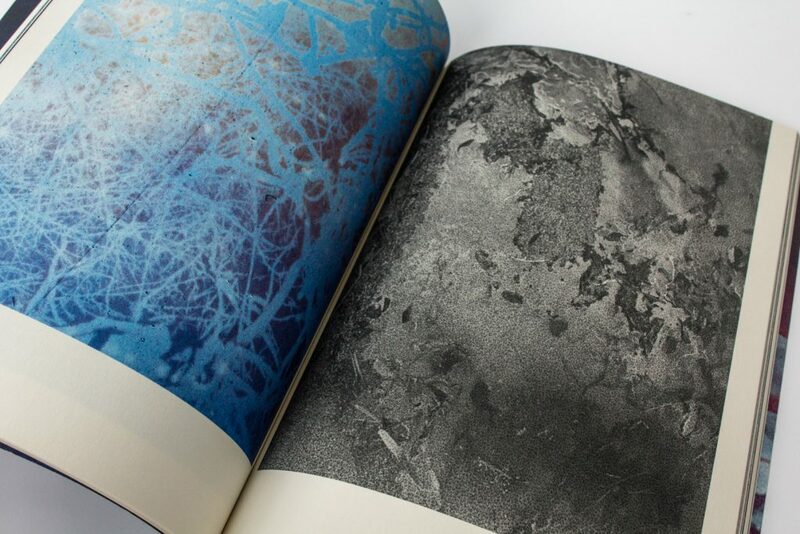 Often handmade, self-printed, or published in limited editions, these books are often considered works of art in themselves. 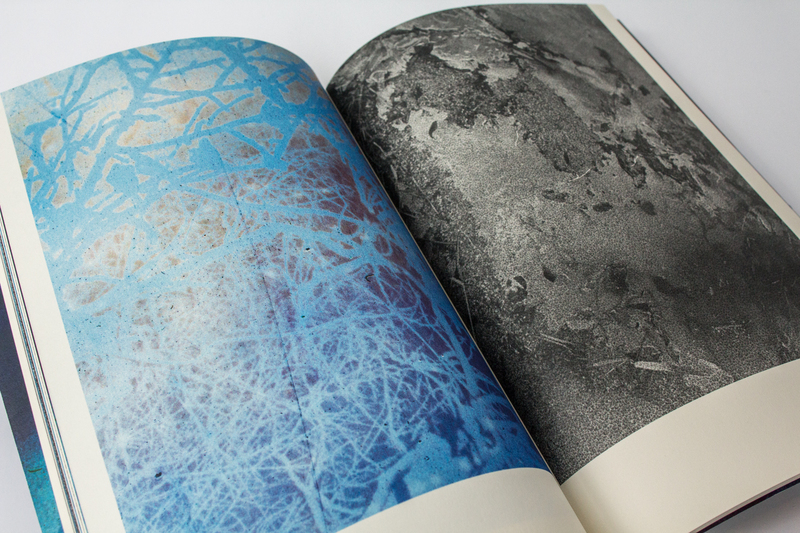 A recent donation of photobooks to the McCaw Foundation Library reminds us that all things are transitory. 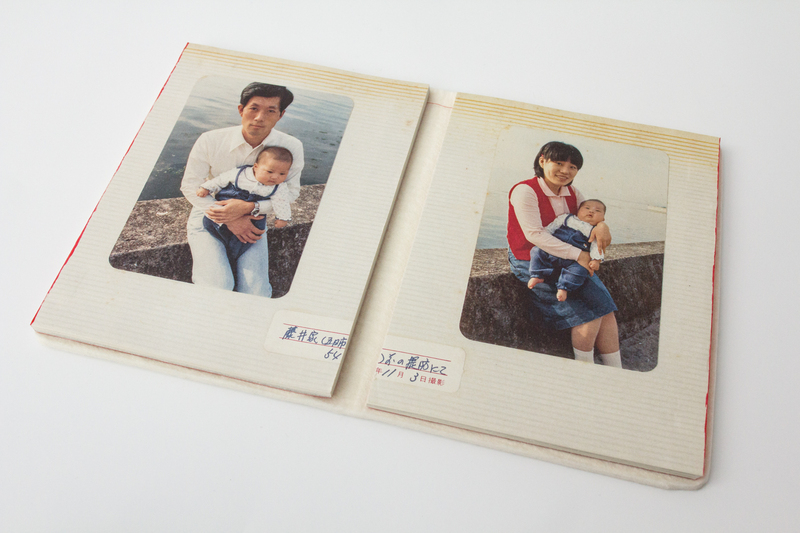 Chris Harris shares images with this generous and poignant gift from his personal collection of photobooks by important Japanese artists. These photobooks speak to us of family ties, of the natural world, and of ephemeral glimpses of urban life and landscapes. Focused mostly in Asian countries, these images are often haunting, sometimes playful, and entirely captivating. Love, time, and ties that bind. A return to the old home town . . . or is it? 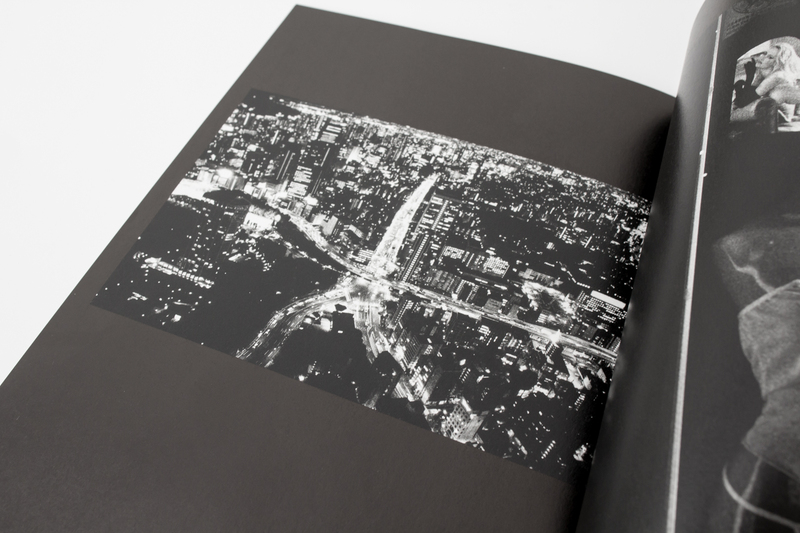 Tokyo is the place that we visit next with Night Crawler by Takehiko Nakafuji (Zen Foto Gallery, 2011). This is a collection of black and white photos of that city, captured during two significant periods of the artist’s life. The first series is comprised of gritty, sometimes eerie images taken in 1995. The street scenes and askew glances of the people in them share with us a youthful insider’s view of 1990s Tokyo. Nakafuji returned over a decade later, in 2010, and generated a second series of photos. Even with the continuity provided by using black and white, gritty-grainy images for both time periods, it is evident that both the city and the artist have matured. It is the same city, the same artist . . . yet both are intrinsically, irrevocably transformed. These photobooks are available for consultation at the Dorothy Stimson Bullitt Library, downtown at the Seattle Art Museum downtown by appointment while the Seattle Asian Art Museum in Volunteer Park is undergoing renovation. When the Asian Art Museum and the McCaw Foundation Library reopen, the photobooks will be available there as an ongoing resource. The McCaw Foundation Library at the Asian Art Museum in Volunteer Park is open to all museum staff, docents, volunteers, members, and the general public. As one of SAM’s three libraries, the McCaw Foundation Library specializes in research materials supporting the museum’s Asian collection and exhibitions that occur at the Asian Art Museum. Anyone with an interest in the visual arts of Asia will appreciate the outstanding collection. The SAM Libraries’ holdings number nearly 60,000 items, with more than a third of those being available at the McCaw Foundation Library. 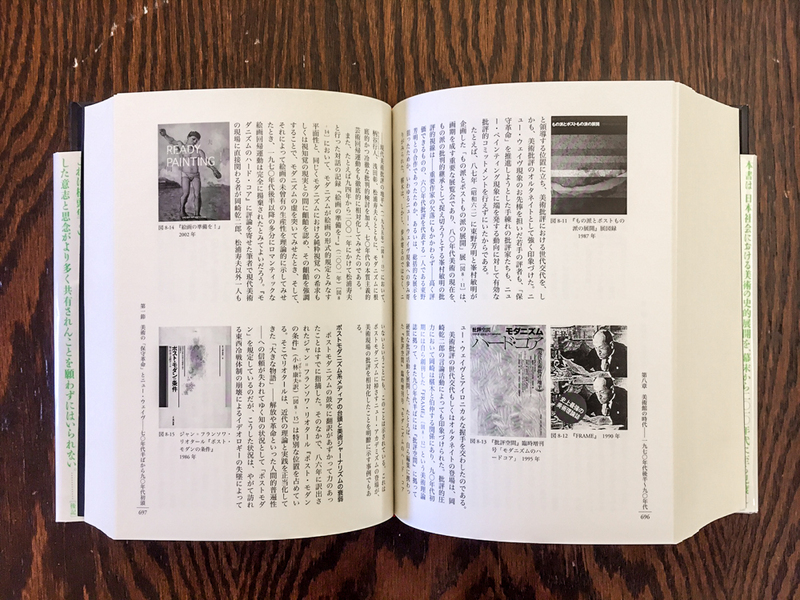 These materials include: books, exhibition catalogues, auction catalogues, serials, videos, and electronic publications, many of which are in Asian languages. These materials support research on objects in the permanent collection, research for special exhibitions, assist in docent-led tour preparation, and provide general information about the history of art in Asia. The Museum’s general operating funds are the primary source of financial support for the McCaw Foundation Library. When the need for additional funding arises, the museum staff collaborates in sourcing the necessary funds. 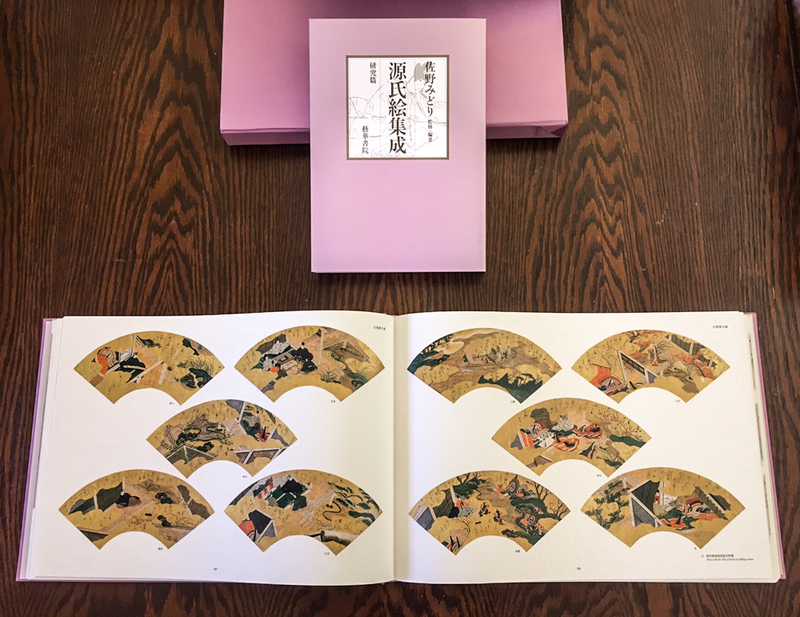 Associate Librarian for Asian Art, Yueh-Lin Chen, recognized the need for additional resources in the library’s reference collection, specifically in the areas of Japanese and Korean art. With guidance from Xiaojin Wu, Curator of Japanese and Korean Art, and assistance from Librarian Traci Timmons, Ms. Chen applied for a grant from The Metropolitan Center for Eastern Art Studies. Founded under the auspices of the Harry G. C. Packard Collection Charitable Trust, and based at Hosomi Museum in Kyoto, Japan, the Center provides grants for advanced scholarship in the arts of East Asia. 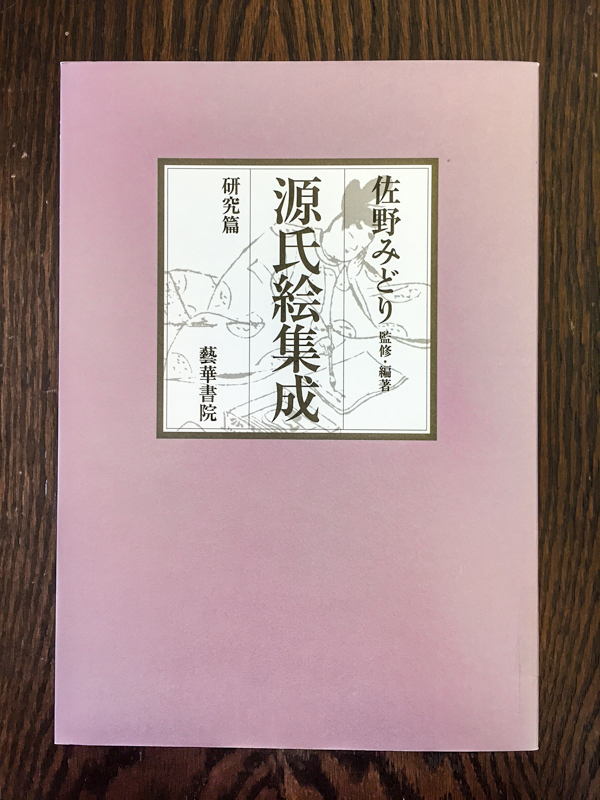 The museum staff’s collaborative effort was successful and the library received a generous grant from the Center, allowing purchase of important resources on Japanese and Korean art. These books will significantly enhance the collection and are available for use in the McCaw Foundation Library. Examples of materials purchased with this grant money are shown below. Visit us to see others and discover the many other exceptional resources the McCaw Foundation Library has to offer. A map is a visual depiction of a particular place, and it is a reflection of the perspectives of the time in which it was made. We can better understand the way people in a particular era saw the world – and their place in it – by looking at the maps they used. 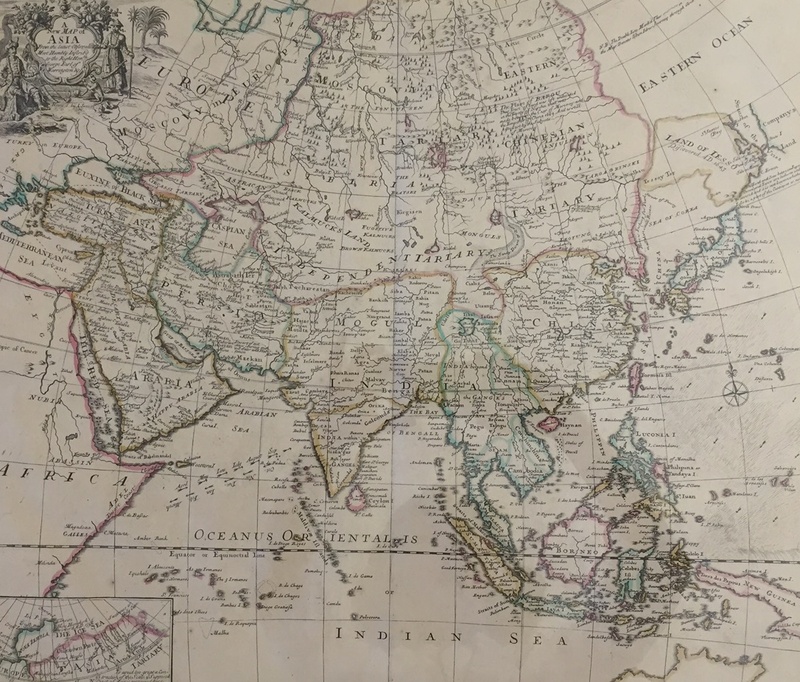 A New Map of Asia from the Latest Observations: Most Humbly Inscribed to the Right Honbe. George Earl of Warrington, 1721. London: D. Browne. SPCOL G 7400 I710 S4. Donated by Frank Bayley, acquired from the collection of former SAM Curator of Japanese Art, William Jay Rathbun. 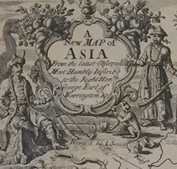 John Senex’s (English, 1678-1740) New Map of Asia, which dates from 1721, is a representation of the technical information available at the time. It also provides insight into the way European explorers viewed the countries in Asia and their relationships to each other. Senex was a geographer to Queen Anne (1665-1714), and one of 18th century England’s best known map makers. 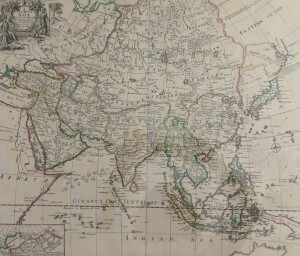 His map of Asia contains a lot of information. Detail from A New Map of Asia from the Latest Observations: Most Humbly Inscribed to the Right Honbe. George Earl of Warrington, 1721. London: D. Browne. SPCOL G 7400 I710 S4. Donated by Frank Bayley, acquired from the collection of former SAM Curator of Japanese Art, William Jay Rathbun. It spans a vast geographical area from the tip of North Africa and part of the Mediterranean in the west to Indonesia and Japan in the east; from what is now Mongolia in the north to New Holland (now called Australia) in the south. It notes the currents along the east coast of Southeast Asia, the Philippines, and the Indian Ocean. Areas that were most thoroughly explored by the 18th-century English are the ones that include the most detail; those that were not as well-known are more generally depicted, such as the “Land of Less” and “Company’s Land,” which are shown as large, indistinct land masses, as is the “Eastern Ocean” to the north of them. In the upper left corner, a cartouche includes two people in stylized Asian dress, surrounded by representations of some typical animals and plants. Suseon Jeondo (Whole Map of Seoul), between 1861 and 1887. Seoul, Korea: publisher unknown. SPCOL G 7904 S4. Donated by Kimerly Rorschach. Similarly, cartographer Jeongho Kim’s (Korean, active 1834-1864) Suseon Jeondo (Map of Seoul) shows us what was important in Korea in 1845, during the Joseon Dynasty. 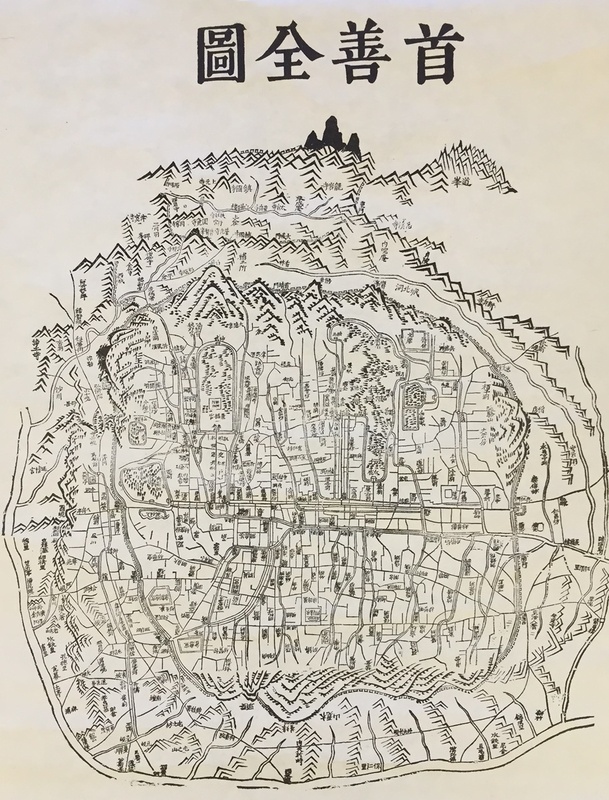 This is a map drawn by someone intimately familiar with the area and the people and practices that characterized the time in which it was made and used. The use of Chinese characters is typical of formal documentation of that time. 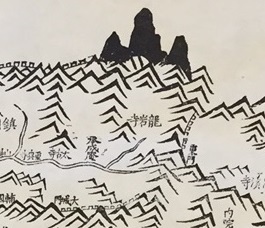 Detail from Suseon Jeondo (Whole Map of Seoul), between 1861 and 1887. Seoul, Korea: publisher unknown. SPCOL G 7904 S4. Donated by Kimerly Rorschach. 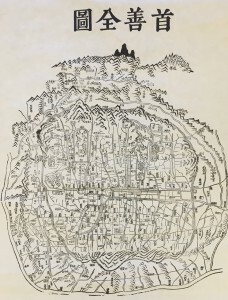 The wood-block print map of Hanyang (Seoul) thoroughly surveys the entire city: major roads, facilities, and villages are realistically represented more or less to scale. These precisely depicted everyday elements of the city are ringed by symbolic portrayals of larger-than-life mountains, creating a significant contrast. These mountains, traditionally a symbolic connection between the sky and the authority of the king, are intentionally drawn larger than to scale to emphasize their connection to the heavens. Kim, Jeongho. A map of Seoul in the period of Joseon Dynasty. Seoul: J. Kim, ca. 1845. Senex, John. A new map of Asia: from the latest observations. London: D. Browne, 1721.